Eva is one of our certified SNUBA Guides. 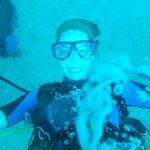 She is also a PADI Open Water Scuba Instructor and Captain, so she is capable, qualified and experienced in any and every situation out on the water. She has been living and working in Sint Maarten for two years and is known in these parts to sings a mean karaoke.